WASHINGTON, June 11, 2010 — Kim Ruoc­co hung up the phone with her hus­band, relieved he had final­ly agreed to seek help for his increas­ing­ly severe bouts of depres­sion. 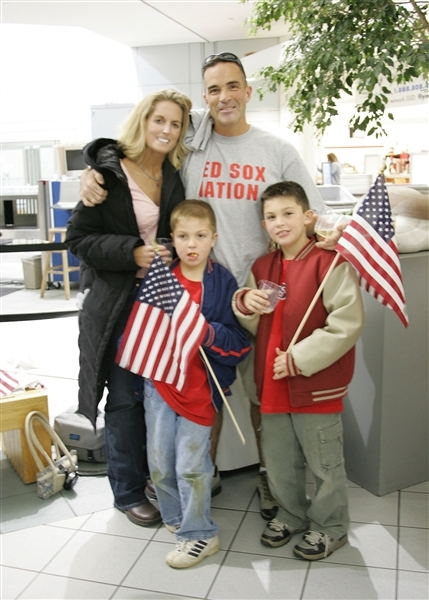 Marine Corps Maj. John Ruoc­co pos­es for a pic­ture with his wife, Kim, and chil­dren, Joey, right, and Bil­ly, in Novem­ber 2004. The major com­mit­ted sui­cide in 2005 after a long bat­tle with depres­sion. His wife has devot­ed her­self to sui­cide pre­ven­tion and assist­ing sur­vivors. Still, she had a nag­ging feel­ing that some­thing wasn’t right. She decid­ed to catch a red eye flight from Mass­a­chu­setts to Cal­i­for­nia, where her husband’s reserve unit was locat­ed, so she could be with him when he sought help. After Ruoc­co land­ed, she called the hos­pi­tal. He wasn’t there. She called his office. He hadn’t shown up. A sink­ing feel­ing set in. Ruoc­co rent­ed a car and raced over to the hotel where her hus­band had been stay­ing. When she arrived, sev­er­al Marines were walk­ing out of his hotel room. “I didn’t have to ask — I knew,” she said. Her 40-year-old hus­band, Marine Corps Maj. John Ruoc­co, an accom­plished AH-1 Cobra heli­copter pilot and father of two, had hung him­self just hours after his con­ver­sa­tion with his wife. Ruoc­co strug­gled to make sense of the loss that shook her fam­i­ly to its core. Yearn­ing to give her husband’s death some mean­ing, she even­tu­al­ly immersed her­self in efforts to com­bat sui­cide with­in the mil­i­tary. Ruoc­co is now the direc­tor of sui­cide edu­ca­tion and sup­port for the Tragedy Assis­tance Pro­gram for Sur­vivors, a non­prof­it orga­ni­za­tion ded­i­cat­ed to help­ing fam­i­lies with a fall­en mil­i­tary loved one. She has shared her sto­ry with thou­sands of troops across the nation, work­ing to fight the stig­ma that kept her hus­band from seek­ing help. Her hus­band had bat­tled bouts of depres­sion for most of his adult life, Ruoc­co explained. Past inci­dents — includ­ing a fatal car acci­dent in high school and air­craft crash­es that took the lives of his friends – had stuck with him through­out the years. But he kept his feel­ings pri­vate, wor­ried about dis­rupt­ing his sky­rock­et­ing Marine Corps career. After more than a decade in the Marines, Ruoc­co was at the pin­na­cle of his career field, his wife explained. An expert pilot, he had accept­ed an Air Force exchange posi­tion at Vance Air Force Base, Okla., where he trained new pilots on the T-37 jet. Ruoc­co took his work “very seri­ous­ly,” she not­ed, and the demands of a fast-paced, post-9/11 mil­i­tary were wear­ing him down. Backed by his fam­i­ly, Ruoc­co decid­ed to sep­a­rate from the Marines. 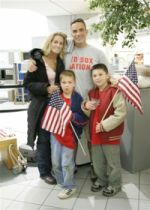 His wife and their then-8- and 10-year-old sons were pleased, since they had grown tired of the fre­quent moves and school changes. The major sep­a­rat­ed from active duty in 2004 and joined a reserve unit in Penn­syl­va­nia. While mov­ing his fam­i­ly to their new home in Boston, he began train­ing to be a pilot with South­west Air­lines in Texas. Two weeks after he joined the reserve unit, Ruoc­co was acti­vat­ed and deployed to Iraq. His deploy­ment went well, his wife said. He flew 75 mis­sions, was award­ed an Air Medal, giv­en for mer­i­to­ri­ous achieve­ment while par­tic­i­pat­ing in aer­i­al flight, and led his troops with pride, she not­ed. But post-deploy­ment, life took a down­turn. The job with South­west didn’t pan out, and his Penn­syl­va­nia-based squadron had moved to Cal­i­for­nia. “The adren­a­line with war was com­ing to a screech­ing halt,” Kim Ruoc­co said. “He was hav­ing dif­fi­cul­ty fly­ing because of the anx­i­ety and depres­sion. It was the snow­ball effect you see so often with sui­cide. John was liv­ing in a hotel room in Cal­i­for­nia, she said, where his depres­sion was wors­en­ing by the day. He was due to deploy to Iraq again in the spring, but doubt­ed his abil­i­ty to lead there and also was afraid of let­ting his unit down, she said. John Ruoc­co died on Super Bowl Sun­day 2005. His beloved New Eng­land Patri­ots edged out the Philadel­phia Eagles for the cov­et­ed foot­ball vic­to­ry. But he didn’t watch the game. On their phone call that evening, Kim asked her hus­band if he was feel­ing so bad that he could kill him­self. He told her he could nev­er do that to her and the boys. “He told me he was going to go on base and get help,” she said. “But also said that would be the end of every­thing; that it would ruin his career. “Noth­ing is more impor­tant to a mil­i­tary man or woman than how peo­ple view you,” she added. The stig­ma of seek­ing help and the fear of being viewed dif­fer­ent­ly pre­vent­ed her hus­band from seek­ing the help he need­ed, Ruoc­co said. Ruoc­co said she’s seen the same sto­ries replayed on mil­i­tary instal­la­tions through­out the world and hopes, by shar­ing her sto­ry, oth­ers will be inspired to come for­ward and seek help. In her talks with troops, she stress­es the impor­tance of nev­er leav­ing some­one in emo­tion­al dis­tress alone. Ruoc­co also explains the signs of sui­cide: with­draw­al; sub­stance abuse; phys­i­cal self-harm; talk­ing about feel­ing hope­less or help­less; talk­ing about want­i­ng to die, even in a jok­ing way; impul­sive­ness; lack of judg­ment; and as a sign of a pos­si­ble immi­nent attempt, agi­ta­tion and angry out­bursts. She’s already seen pos­i­tive signs of change, she said, thanks to Defense Depart­ment efforts to low­er sui­cide rates and end the stig­ma of seek­ing help. To illus­trate, Ruoc­co described a vis­it to Fort Hood, Texas, about a year ago. Many sol­diers approached her cry­ing, and told her that was the first time they felt they could share their feel­ings. She returned there in the spring, and it was a dif­fer­ent sto­ry, she said. “A lot of sol­diers came for­ward and said they got help or they noticed a sol­dier and took him to help,” she said. Ruoc­co praised the mil­i­tary for its recent sui­cide pre­ven­tion efforts, but stressed more work remains. She serves on four Defense Depart­ment task groups ded­i­cat­ed to com­bat­ing the military’s sui­cide rate, and is focus­ing efforts on build­ing up fol­low-on care for sur­viv­ing fam­i­lies. Even one sui­cide is too many, she said. Ruoc­co also is work­ing to com­bat the stig­ma asso­ci­at­ed with mil­i­tary sui­cides, some­thing that plagued her in the days fol­low­ing her husband’s death. Sur­viv­ing fam­i­ly mem­bers often keep the cause of death from oth­ers, par­tic­u­lar­ly from their com­mu­ni­ty and church, for fear of judg­ment. Five years ago, Kim kept the cause of death from her own chil­dren. In shock and unsure how to han­dle the sit­u­a­tion, she told her sis­ter, who was watch­ing the kids, to tell them it was an acci­dent. The secret only com­pounds the pain, she said. Ruoc­co imme­di­ate­ly pulled the car over and told her sons the truth, in terms they could under­stand. She talked to them of war and depres­sion, and com­pared men­tal pain to that of phys­i­cal pain. “That day, we start­ed again from scratch,” she said. “They were angry and con­fused, but it was a relief to tell them. I didn’t have to wor­ry about them over­hear­ing some­thing any­more. In the years since, Ruoc­co and her sons have worked on tak­ing on healthy roles and build­ing new, hap­py mem­o­ries. They trav­eled to Flori­da and the Caribbean and immersed them­selves in the military’s and TAPS’ sup­port. Ruoc­co now focus­es on cel­e­brat­ing her husband’s life, rather than dwelling on how he died. She cites Enid, Okla., as an exam­ple of a com­mu­ni­ty that has cre­at­ed a touch­ing cel­e­bra­tion of life. She returns there to Vance Air Force Base, the family’s last active-duty sta­tion, each year to vis­it with old friends. On her last vis­it, she stopped by a town memo­r­i­al, where a stone is placed for each mil­i­tary mem­ber from Okla­homa who died while serv­ing the nation. To her sur­prise, the park includ­ed a plaque in mem­o­ry of her hus­band.